Copying a campaign will create an identical replica in your in progress campaigns section. This slightly differs to sharing campaigns, as sharing will sit in your reporting section and allow you access to the reporting metrics. To find out more about sharing campaigns, click here. To copy a Campaign into the same account, click the dropdown arrow on the right hand side of the campaign and click 'Copy'. If you wish to copy the campaign into a different account choose the Copy To option. 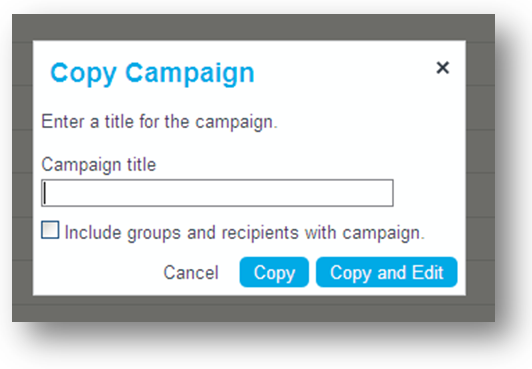 You will then be prompted for a ‘Campaign Title’ in the ‘Copy Campaign’ window. Enter a title for your Campaign and click 'Copy'. To include groups and recipients click the tick box named ‘include groups and recipients’. 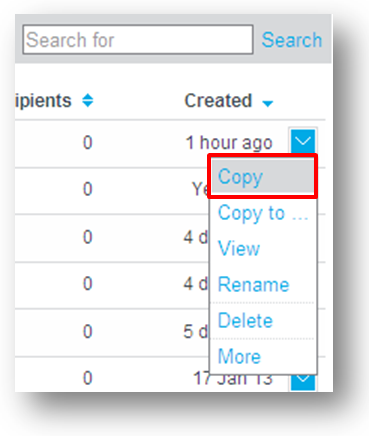 If you wish to edit the copied Campaign directly after creation then click the ‘Copy & Edit’ button.